The Barclays Center still has (mostly) a two-toned sidewalk, given dripping rust from facade. So much for that promised power wash.
Sure, it's hardly the biggest thing about the Barclays Center. But shooting some photos last week I was struck by the distinctly two-tone sidewalk visible bordering both Atlantic and Flatbush avenues, caused by rust dripping from the pre-weathered--but not fully pre-weathered--facade. And I was struck how the sidewalk repairs/replacements on Atlantic Avenue, below right, seem to be limited to structural rather than cosmetic issues, setting up a pattern in which rusty stains prevail. The deliberately rusted facade has dripped patches of bright orange onto some of the surrounding sidewalks, and left them looking as though a very tall and mischievous teenager had gone at them with a can of pumpkin-colored spray paint.Was this the plan? As I wrote yesterday in City Limits, Mayor Bill de Blasio's office, in coordination with developer Greenland Forest City Partners, in June 2017 orchestrated positive coverage of a "100% affordable" apartment building skewed to middle-income households, with consultant BerlinRosen--working for the developer and with a claimed "agents of the city" relationship with the mayor--serving as intermediary. Here's some more context. In a December 2017 interview with reporters from the then-closed local websites DNAinfo New York and Gothamist (the latter has since reopened), de Blasio was asked (by DNA's Rachel Holliday Smith) about a stark smudge on his affordable housing record: nearly 100 apartments left empty at 535 Carlton, a "100% affordable" tower in the Pacific Park Brooklyn project (formerly Atlantic Yards). I have an article today in City Limits based on the "agents of the city" email trove that the mayor's office was forced to release, which it did last Thursday, just before the long weekend, De Blasio Emails Shed Light on how ‘Affordable Housing’ is Packaged for the Press. 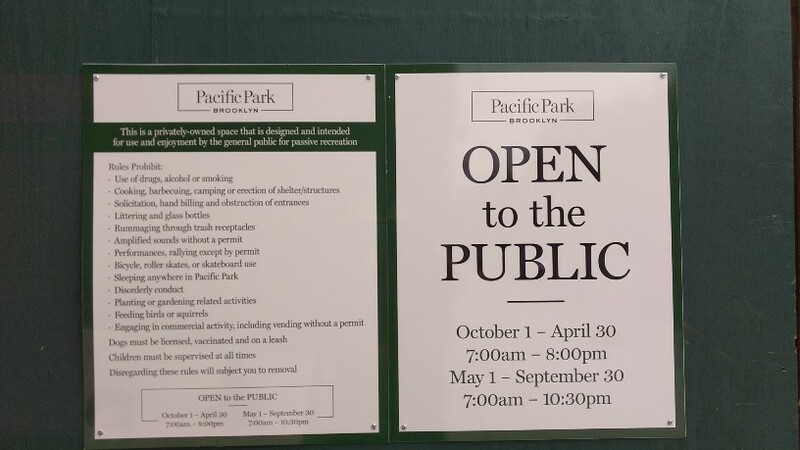 The latest Atlantic Yards/Pacific Park Construction Update (bottom), covering the two weeks beginning Monday, May 28, was circulated at 12:16 pm Friday (lead time) by Empire State Development (ESD) after preparation by Greenland Forest City Partners. MPT (Maintenance and Protection of Traffic) installations for the East Portal Median Reconstruction is supposed to begin during this reporting period, according to the notice, though a separate notice last week said the first phase, the closing of the west crosswalk, was supposed to begin May 23. I wrote two weeks ago about how the lack of open space in Prospect Heights means that new residents (presumably) are using Dean Playground, with artificial turf and a ban on pets to walk their dogs and, in some cases, leave deposits. City issues first affordable housing RFP requiring modular construction, reported The Real Deal 5/24/18 regarding a city-owned parking lot in East New York. It's part of a new city push for mid-rise (not high-rise) affordable modular construction, avoiding the potential hazards that emerged from Bruce Ratner's grand plans. Indeed, on 3/1/2018, the city's Department of Housing Preservation and Development issued a Request for Expressions of Interest regarding a modular construction pilot program, especially regarding "market participants knowledgeable about mid-rise plus (4+ story) multifamily, supportive, and senior housing development." “The Grant Avenue RFP will be key to developing our understanding of how modular housing can work for the New York market," said Deputy Mayor Alicia Glen, in a statement reported by the Real Deal. The site, at 581 Grant Avenue, is on the corner of Pitkin and Grant Avenue, adjacent to the Grant Avenue A train subway station. In another sign of Forest City New York's diminished capacity, a key development executive on Atlantic Yards/Pacific Park, and other projects, has left the company. As the Commercial Observer reported yesterday, Oxford Properties Hires Forest City Exec to Run NY Development:Oxford Properties Group has hired Forest City New York Senior Vice President Kate Bicknell as a vice president and the head of its New York development team, Commercial Observer has learned. Bicknell, who spent 13 years at the New York arm of Cleveland-based Forest City Realty Trust, officially joined Oxford on Monday. Yesterday, I wrote about how the sale of the Brooklyn Nets to Joe Tsai had essentially rescued the Barclays Center finances, because it created a new reserve fund. There's more to the story, though we don't have all the details. On 4/10/18, the little-known Brooklyn Arena Local Development Corporation (BALDC), the state entity set up to issue tax-exempt bonds for the arena, held a little-noticed meeting. At 12:16 of the video, though, there's an interesting passage in which the BALDC board approved allowing a broader range of operating and maintenance spending to come from an account funded by the required annual payments in lieu of taxes, or PILOTs. The recent blockbuster sale of 49% of the Brooklyn Nets by billionaire Mikhail Prokhorov to fellow billionaire Joe Tsai—a deal valuing the team at $2 billion-plus and which is expected to lead to Tsai’s full control of the Nets by 2021—didn’t just represent a big payday for Prokhorov. It also provided a crucial backstop to the uncertain finances of the Barclays Center operating company, now owned by Prokhorov’s Brooklyn Sports & Entertainment (BS&E), which has consistently reaped far less of a profit than expected, due in part to a bad deal with the New York Islanders. Though the $1 billion transaction with Alibaba tycoon Tsai did divert additional revenues from the arena to the team, as ratings agency Moody’s explained May 14, it also allowed Prokhorov to create a $345 million reserve fund to deliver supplemental revenue and ensure that bondholders are repaid. According to a Community Notice sent yesterday from Pacific Park Brooklyn, temporary changes to the roadway around Vanderbilt and Atlantic avenues are scheduled to begin tomorrow, Wednesday, May 23. No time frame or duration was provided. This work was not previewed in the latest two-week Construction Update, dated May 14. As part of the construction of the Long Island Rail Road East Portal project, the center median of Atlantic Avenue will be reconfigured at the intersection of Atlantic and Vanderbilt Avenues. To accommodate this work, the west crosswalk of the intersection of Atlantic and Vanderbilt Avenues will be closed beginning on on Wednesday, May 23. Pedestrian traffic across Atlantic Avenue will be detoured as per the diagram below. Also, the westbound B45 bus stop on Atlantic Avenue will be relocated one block west, moving from the northwest corner of Vanderbilt Avenue to the northwest corner of Clermont Avenue. Remember how ESD predicted that middle school would open in fall of 2018? It looks like 2021 at best. Joining Bruce Ratner's unreliable prediction of 2018 project completion should be the prediction, just two years ago, that the promised middle school--dubbed M.S. OneBrooklyn by advocates--would open this year. Consider the 7/18/16 letter (below) from Howard Zemsky, President and CEO of Empire State Development, the state authority overseeing/shepherding Atlantic Yards, as first published 8/16/18. Responding to concerns raised by Assemblymember Walter Mosley and fellow legislators, Zemsky wrote, "A district wide middle school is also expected to open in the Fall of 2018." As of then, that was doubtful. I'd written a month earlier that the plan for 664 Pacific, a 27-story market-rate rental building with a school at its base, was delayed, and project documents suggested it would be a four-year buildout. Stay tuned, all of those waiting for action on the seemingly stalled Site 5 project. Well, a change was (seemingly) contemplated as of June 2015, when the Offering Plan for the 550 Vanderbilt condominium was filed with the New York State Attorney General. As excerpted below, it indicated that there would be a modification to the project's governing Development Agreement, to be approved at a later date. The most obvious candidate is Site 5, given that it requires first a revision to the project's guiding Modified General Project Plan, in order to move bulk approved for another site, B1 (aka "Miss Brooklyn") across the street, and then surely an amendment to the Development Agreement between the state and developer. Recently, the Association for Neighborhood & Housing Development (ANHD) released the 2018 edition of their annual housing risk chart, How is Affordable Housing Threatened in Your Neighborhood? As the organization explains, each year, it collects a variety of indicators of key threats to affordable housing in the city that illustrate issues and patterns that are specific to each community district, as well as the city as a whole. This year’s housing risk chart shows displacement is a growing crisis. The neighborhoods losing the most affordable rent stabilized units between 2015 and 2016 are Astoria (634), Central Harlem (500) and Bedford Stuyvesant (460), or Brooklyn Community Board 3. In Brooklyn, Bedford Stuyvesant had the most new residential units approved, with over 1,000 new units in 2017. It also had a dramatic decline (-81.8%) in home purchase loans made to low- and moderate-income buyers, as did Brooklyn Community Board 6, Park Slope/Gowanus/Red Hook (-85.7%). Yes, Gilmartin says she expects Site 5 to be built, rejects her company's original "urban planning decision"
So, former Forest City Ratner/Forest City New York MaryAnne Gilmartin, whose new company L&L MAG has a service contract to represent Atlantic Yards/Pacific Park, wants to see Site 5 built. Building a 1 million-square-foot-plus tower with significant office space at site five — occupied by P.C. Richard & Son and a Modell’s — would help amend that, she said during a panel at TerraCRG’s Only Brooklyn conference on Wednesday. Developer debuts West Portal, easing LIRR path to terminal; upgrades said to be worth $500 million! Newsday and two TV stations seem (so far) to be the only news outlets covering the unveiling of the operational West Portal to Atlantic Terminal, an upgrade to the Vanderbilt Yard that allows trains being stored and serviced to go directly to the commuter tracks rather than perform a more time-consuming and awkward maneuver. For more than a century, routing a train from Atlantic Terminal into the yard, where it would be cleaned and serviced, required a complicated and time-consuming set of movements. Trains would have to travel east from the station about three-quarters of a mile, and then back west again through the only portal leading to the adjacent outdoor rail yard. The movement, which takes about three minutes to complete, would block all train traffic into and out of the station until the tracks were clear. Sports betting is coming, thanks to a U.S. Supreme Court decision, and it will have to affect sports fandom in New York City, as well as the atmosphere around venues like the Barclays Center, which, after all, already has the Resorts World Casino NYC Plaza. It is legalizing what is now an underground economy, and, as in London, there may be numerous legal betting outlets, with the ability to bet on various aspects of the game (quick: how many assists will LeBron get?) and gambling companies will be advertisers and sponsors. Gambling and the point spread will be part of game analysts' discourse. And there will be the collateral damage of problem bettors and, perhaps, some shady behavior (though there will be new safeguards). The latest Atlantic Yards/Pacific Park Construction Update (bottom), covering the two weeks beginning Monday, May 14, was circulated at 12:58 pm yesterday by Empire State Development (ESD) after preparation by Greenland Forest City Partners. That seems only slightly late to alert people to construction work, but, actually, they missed a week. The previous two-week Update was issued for April 23. Why were they so sloppy? I don't know; my query about the delay hasn't yet gotten an answer. But there's no new vertical construction or much, if any, new infrastructure work. Some of what was predicted in the previous Update regarding potentially disruptive work at the Vanderbilt Yard continues, though it appears in red in the document below, which indicates new work, though it's not. The original 5/9/18 Wall Street Journal article, Trump Lawyer Helped Recruit Corporate Client With Ties to Kushner Probe, subtitled "U.S. Immigration Fund LLC, which supplied Chinese investors to Kushner Cos., is among clients Michael Cohen delivered to Squire Patton Boggs," is paywalled, but it's a doozy. The gist: the EB-5 investor visa program is just as sketchy as we suspect, and a key national figure in it--who's raised money for Atlantic Yards--is at the heart of it. President Donald Trump's personal attorney Michael Cohen helped a law and lobbying firm land a corporate client with ties to Kushner Cos., the family company of White House adviser Jared Kushner that is currently the subject of a federal probe. Shadowing that, it seems, is response to the Atlantic Yards/Pacific Park project. DSBA members have absorbed significant project impacts, and have led efforts to monitor the project. According to a post on the group's web site, a meeting Monday will address the possibility of including St. Marks, Carlton, and 6th Avenues, as well as Bergen, Dean and Pacific Streets. The meeting will be held at 7 pm at the Community Room at the Latin Evangelical Free Church, 506 Bergen Street. "This is a special area with shared issues," the post states. "We have a history of working together successfully." The DSBA has held public meetings nearly every month since 2004.